Patients with advanced arthritis can return to average activity levels while delaying total knee replacement according to a Steadman Philippon Research Institute orthopedic research study. This study is significant because it found that patients who received the 'Package' treatment could maintain an average activity level and avoid having a total knee replacement for up to a decade. The Steadman Philippon Research Institute (SPRI), a world leader in orthopedic and sports medicine research, has recently published a study on the use of arthroscopic treatment of advanced osteoarthritis to delay the need for total knee replacement. Dr. Richard Steadman, well known for pioneering orthopedic treatments such as microfracture, led the groundbreaking study. The study evaluated the ten-year survival of knees with moderate to severe arthritis treated with a systematic arthroscopic approach developed by Dr. Steadman known as the “Package”. The package combines several procedures to address pain generators in the knee and increase the volume in the knee to provide more motion. The results of this study confirmed that the procedure extended the life of the native knee for up to a decade in some patients before they needed to take more drastic measures for treating osteoarthritis. This study, titled "Ten-Year Survivorship after Knee Arthroscopy in Patients with Kellgren-Lawrence Grade 3 and Grade 4 Osteoarthritis of the Knee," is significant because it found that patients who received the Package treatment could maintain an average activity level and participate in recreational sports. Patients in this study wanted to avoid total knee replacement to retain their activity level and delay knee replacement surgery. Patients were aware that the Package is a treatment for reducing symptoms and delaying knee replacement and not a cure for arthritis. Although there’s some controversy with arthroscopy in older patients with advanced osteoarthritis, many patients in the study delayed knee replacement while enjoying a high quality of life and maintaining satisfactory activity levels. “The study shows the patients were very satisfied with the results. People who can put knee replacement off for two years are very happy, and when you get into three, four, five and beyond, they're even more relieved,” says Karen Briggs, SPRI’s Director of Center for Outcomes-Based Orthopaedic Research. After active patients younger than 60 exhaust conservative treatments, they often have total knee replacement, the predictable surgical treatment for moderate to severe osteoarthritis. However, this option isn’t ideal for all patients, especially those under 60 or those who wish to return to an average activity level or sport. Studies suggest that only 20 percent of patients receiving total knee replacement can return to higher-impact sports. Some surveys, like the one from The Knee Society, recommend against any high impact activity such as tennis, soccer, jogging, basketball or climbing. The Steadman Philippon Research Institute study included 81 knees in 73 patients (male and female) who underwent knee arthroscopy for symptomatic and advanced osteoarthritis. All participants initially tried conservative measures for treating their arthritic knees, none of which relieved their symptoms. As part of the study, individuals went through the steps and techniques of the comprehensive arthroscopic Package procedure. 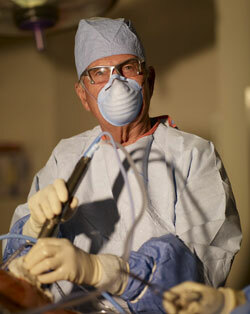 The treatment also includes a very defined rehabilitation program, also developed by Dr. Steadman. The keys of rehabilitation program include maintaining patellar mobility and overall knee motion. While not every participant in the study saw the same results, most showed positive outcomes that support the Package as a viable option for patients who want to delay total knee replacement. Scientists concluded that the mean survival time after arthroscopic treatment of osteoarthritis with a deﬁned rehabilitation protocol was 6.8 years and that 40 percent of the study group delayed total knee replacement for a minimum of 10 years. For more information about this study, please visit http://www.sprivail.org. The Steadman Philippon Research Institute (SPRI) is dedicated to keeping people of all ages physically active through orthopaedic research and education in arthritis, healing, rehabilitation, and injury prevention. Founded in 1988 by orthopaedic surgeon Dr. Richard Steadman as the Steadman Sports Medicine Foundation, the 501(c)(3) charitable organization has influenced the practice of orthopedics worldwide. Based in Vail, Colorado, it has become one of the most published organizations in sports medicine research and education.